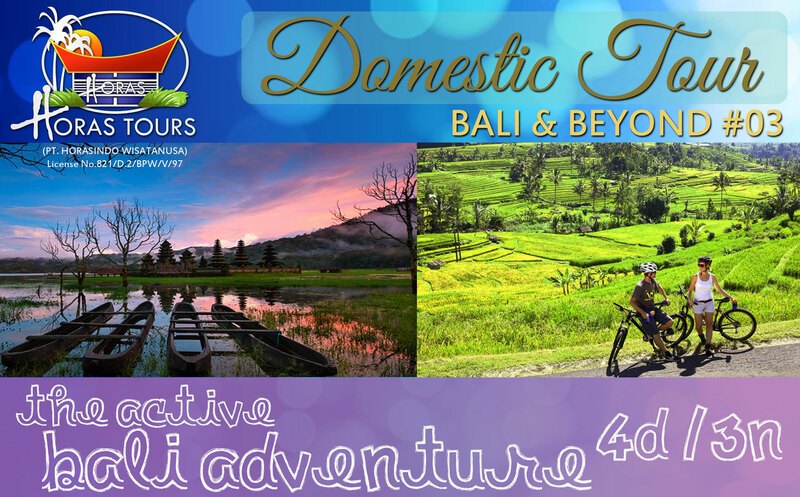 4D/3N The Active Bali Adventure DAY 1: Tabanan - Bedugul - Ubud Get ready to be energized by the selection of Bali’s awe striking natural beauty and heritage! Make sure you’re prepared with sunscreen, comfortable trekking shoes and apparel for today’s trekking session. We’ll take you up to the mountain region of northern Bali to visit the orchids and spices market at Candi Kuning. Then, we’ll take a short drive to the 3 lakes area of Batur, Buyan and Tamblingan Lake near Bedugul village. We will start our 2.5-hour trekking excursion around Tamblingan Lake feasting on the rich jungle, green plantation and stunning lake view along the way. Coming back from your refreshing walk, we’ll visit the Bratan Lake for an exquisite look at Pura Ulun Danu Temple floating by the lakeshore. Wind down and overnight at Bali’s favourite art region, Ubud. DAY 2: Ubud – Tampaksiring - Kintamani Get excited for the awaited highlight of the today’s tour: rafting! Please prepare towel and change of clothes as you will be soaked, and toiletries should you wish to shower. After breakfast, check-out from hotel. Scour the diverse artsy handicrafts at Ubud’s traditional market as your guide introduces different kinds of exotic spices, fruits and traditional woodcarvings. Now get ready for rafting adventure at Ayung River, where you will experience 2-hour of fun sailing across exciting trepid with gorgeous view of tropical landscapes and lush jungle. At the end point in village Kedewatan, you can shower and change before our next destination to Goa Gajah. After a quick sightseeing, we’ll journey on to visit Pura Tirta Empul at Tampaksiring - one of the temples that is famous for the pure spring water that the locals use for holy rituals of cleansing and healing. You will also get to see the old summer residence of the first President of Indonesia, Mr. Soekarno. Next, we’ll take you to relax and feast your eyes on the stunning paddy fields array complimenting the splendid panorama of Mount Batur Volcano. Overnight at a lake-view hotel. DAY 3: Kintamani – Gianyar – Klungkung - Candidasa Enjoy your breakfast with the luxurious view of Mount Batur. Load yourself up with nourishing breakfast before we begin the fun bicycle tour from Kintamani to Pejeng. We will bike downhill and enjoy the diverse plantation, charming rice paddies and the little traditional villages at a relaxed pace. Reenergize with the lunch buffet before we head to East Bali. We will en route to Klungkung to visit historical royal court hall in Kerta Gosa and the mystical bat cave Goa Lawah. Overnight at Candidasa. DAY 4: Candidasa – Bunutan - Tirtagangga Get your blood pumping and running today because we’ll be taking you to an unforgettable trekking journey to see Bali like you’ve never seen it before. Travel along the beautiful east coast to village Abang where we will use the mountain road to reach Pura Luhur Lempuyang. This great white limestone temple is situated at Bukit Bisbis where you will get a one-of-a-kind view over the island. From the main temple, we will start a 2.5-hour trekking to the top of temple where you will be greeted with an uninterrupted view of Bali that makes the journey uphill worth it! Take your time and capture the glorious view before heading down. We’ll wrap up your day with a rejuvenating visit to Tirtagangga Water Palace and drive you back to your next hotel.